Ask anyone and they may tell you hibernation is when an animal “sleeps” through the winter. Although this is a very simplistic definition, the concept is correct. The word hibernation is from Latin and means “to spend the winter”. Wildlife uses hibernation to get through the winter by utilizing mechanisms to survive the cold or the lack of food. There are many examples of hibernation, including frogs freezing solid, turtles in mud underwater, chipmunks slowing their heartbeats, bats in caves, and the most famous example: bears in winter dens. So, what would the opposite of hibernation be? Is there such a thing? Spotted Turtle – “I hibernate AND estivate. I know the difference. Do you? Summer is typically known as a time of plenty for wildlife. So why would wildlife need to survive through the summer in the same manner they do during the winter? Well “summer hibernation” does exist and it is called estivation. Estivation is used by many species of wildlife including reptiles, amphibians, fish, snails, worms, and insects. Wildlife can go into dormancy during times of very high temperatures and/or drought. Have you ever been active on a hot humid day and felt exhausted just because of the temperature? Heat exhaustion and heat stroke are a real threat to humans and likewise to wildlife. Because water is important to all living things, many wildlife species can be found near water sources. Going dormant to conserve water, especially for species that spend most of their time in water, could be crucial for survival. A local example of estivation in Indiana is the spotted turtle (Clemmys guttata, candidate for federal endangered species listing and state-endangered). Spotted turtles are usually found in still waters like ponds and flooded wetlands, and will forage in damp woods and fields. Spotted turtles are hard to find in the summer and warmer parts of autumn because they “go to ground” to wait out dryer, hotter periods of the summer. 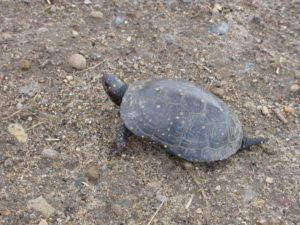 There are accounts of spotted turtles being under sphagnum moss and humus 300 feet (90 meters) away from a water source. Now you have learned a new word, concept, and why a creature in your backyard sometimes takes a vacation during the summer. An estivation vacation may not be a trip or for fun, but it is a great adaptation for survival.